On Aug. 30, the United States Mint and National Park Service will introduce the quarter commemorating New Jersey’s Ellis Island National Monument. Designed by Barbara Fox and sculpted by Phebe Hemphill, the Ellis Island quarter depicts an immigrant family approaching the island with a mixture of hope and uncertainty. The hospital building can be seen in the background. Inscriptions around the design are ELLIS ISLAND, NEW JERSEY, 2017 and E PLURIBUS UNUM. This year’s fourth quarter ceremony will be at the national site itself, which is depicted on the quarter’s reverse. Two related events support the official release. There’s a coin exchange immediately after the ceremony and a U.S. Mint coin forum about 30 minutes or so following the ceremony. All three events are free and open to the public. Ellis Island quarters enter circulation two days before the launch ceremony, on Aug. 28, but it can take months, possibly years, before they’ll appear regularly in change since the Federal Reserve System distributes coins to financial institutions without regard to their designs. The ceremonial event offers an early opportunity to get the quarter. Quarter ceremonies are unique events for locals, coin collectors, and children. They can last 30 to 40 minutes, while various speakers provide background about the historical site, local entertainers perform, and official dignitaries unveil the new coin. 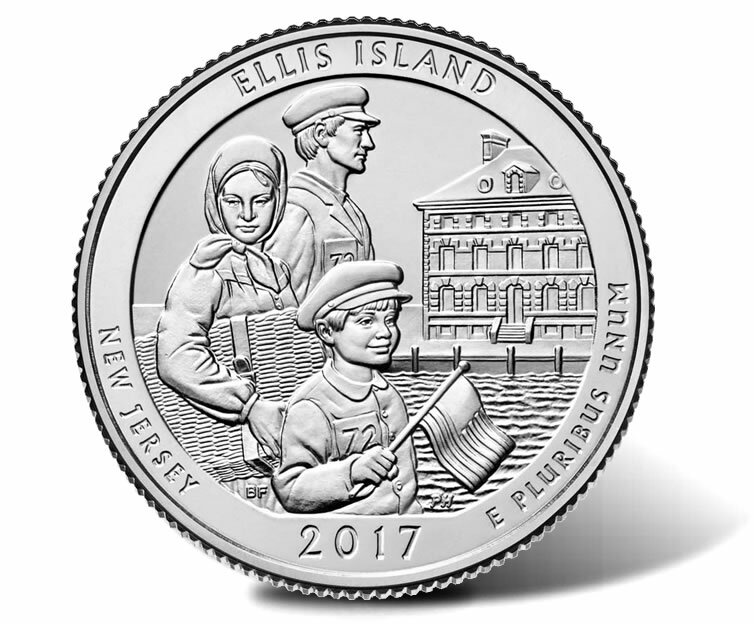 Children age 18 and younger will receive a new Ellis Island quarter to commemorate the occasion, free of charge. The coin exchange begins immediately after the ceremony. Those attending it can stand in line to trade cash for $10 rolls of the new quarter. There is usually a one-roll ($10) minimum and a 10-roll ($100) maximum. A coin collector forum will take place beginning at 12:30 p.m. in the same area of the ceremony. These forums offer everyone an opportunity to learn more about current and upcoming U.S. Mint products. Coin forums usually last about an hour. On Monday, Aug. 28, the U.S. Mint at noon ET will begin selling Ellis Island quarters directly to the public. Product options include Mint-branded 40-coin rolls, 2-roll sets, 3-roll sets, and 100-coin bags. Their prices range from $18.95 to $46.95. They will be available at catalog.usmint.gov. These product releases will also be covered here on CoinNews. 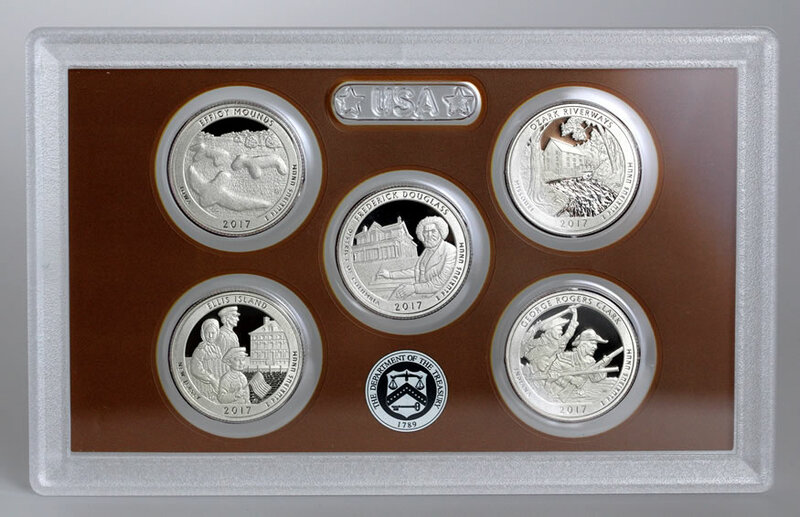 The U.S. Mint’s series of America the Beautiful Quarters® debuted in 2010 and will last until 2021. Every year five unique designs appear that feature a park or other national site within the United States or its territories. In February, the quarter honoring Effigy Mounds National Monument in Iowa made its debut. It was followed in March with a quarter for the Frederick Douglass National Historic Site in Washington, D.C. The third quarter, depicting Ozark National Scenic Riverways in Missouri, launched in June. The final 2017 quarter celebrates George Rogers Clark National Historical Park in Indiana. It will be available in November. CoinNews photo of a lens holding five coins of the 2017 ATB Quarters Proof Set, which launched earlier this year for $14.95. The U.S. Mint also offers special collectible products with quarters. In January, proof versions of all five 2017 quarters launched for $14.95. These coins feature frosted designs on mirror-like backgrounds. Sales of proof editions in silver started on Feb. 16 for $31.95. This year’s uncirculated set of quarters was released on April 10 for $12.95. Uncirculated quarters look most like those found in circulation, but have sharper contrast and are more brilliant. As always, stay tuned to CoinNews for information about related quarter releases. Something wrong on this coin . Where is the stars on flags,missing ? If US mint can put Muslim flag on last year coin . Why they can not put our glory American flag in this coin ?